This middle way between what is seen and unseen, between the problems of failed expectations and future foolishness, affords the useful argument that “hope [is] oriented to the unseen but fully immanent anchor of the seen.” The hopeful then need not gain “a clear picture” of her world because “she can never see directly through God’s eyes” but is instead “always approximating and experimenting, listening to everything God says about the world’s possibilities but never receiving…[a] clear blueprint for utopian paradise” (52). Permanently provisional in the space of “what remains to be seen,” we can only plant the “word” and “then watch to see whether it grows (see Alma 32: 28-43)” (53). Joe arrives at this helpful position about the experiment that is the present in a way that I think deserves slight clarification. In otherwise clear-minded exegesis of the philosophical acrobatics involved in the relationship of what we see, what we cannot see, and what remains to be seen, Joe makes what I take to be an unneeded detour in his claim that the category of the unseen is actually “included in the seen through its exclusion from it; it is included as an exception” (50). On the face of it, this contradiction—that one thing be included in something else because it is excluded from it—is a paradox almost worthy of the logician Bertrand Russell, and yet I understand why Joe seeks to connect what “remains to be seen” to the seen as “the invisible anchor of the visible” (51): without this connection, what remains to be seen might fall back into simply been unseen; but with it (however questionable the connection may be), Joe roots hope, while invisible in content, in the present world. Let me suggest a different (and middle-school nerdy) way for showing how “what remains to be seen” may be a higher order for expressing both what is seen and what is unseen—and to do so without necessarily puzzling through the full set of Rumsfeldian (or alternatively, Zizekian) ruminations on seen seens, seen unseens, unseen seens, and unseen unseens. Instead lets imagine what Joe calls “what is seen,” “what is unseen,” and “what remains to be seen” are analog to the relationship between a known, an unknown, and a variable in algebra. Each element of the equation 3 x 4 = 12, for example, is a known; like Ralphie’s image of the BB gun, each is fixed in our mind (although this passing claim saves for another day fascinating questions about embodiment and inscription in mathematics). The X in 3X = 12 is an unknown because, upon encountering it (like a present under a tree), we know the X contains one specific but currently unknown possibility. With work, what is unknown becomes what is known; with a little work, “X” above reveals the number four while a wrapped present reveals a new wool sweater. Adding a variable “what remains to be seen” introduces a new dimension to our algebraic analysis: for example, in the equation Y = 3X – 12, X and Y are variables. Variables may look like unknowns but they are a world apart: variables contain infinitely many knowable sets of possibilities, not one unknown possibility. In the Christmas tree example, a variable is the general category of “a present”: it contains any one unknown thing. In Spencer’s analysis, a variable is “what remains to be seen”: it contains infinite possibilities in the present, all of them unseen until specified. A variable, like hope, cannot be either only one thing or anything at all; it expresses a particular set of infinite possibilities. Thus the variable “what remains to be seen” exhibit a more general order of what is seen and unseen, known and unknown. In short, For Zion stands ready to richly reward the attention of all those who seek to resolve the contradiction contained within the all-encompassing and at once with unspecified claims that both Christian hope and the law of consecration thrust upon our attempts to work out our complexly interwoven lives here and now. His epistemology neither excludes nor requires a supernatural or metaphysical beyond for Pauline hope to work here and now; in fact, in the fourth and fifth chapters at least, he frames time and space as the unfolding infrastructure within which to wield general principles about hope. I suspect these principles, like all those in science and religion, operate in life with more truth and subtlety than the blunt cudgels of narrow truth claims could ever muster. Our universe, the theology in For Zion implies, avails itself more abundantly to all creatures willing to lead consecrated lives subject to continuing modification and that strikes me, especially in the next post about rereading texts in chapters six and seven, as an argument deserving another glance. Ben, another excellent post. I wish I had time right now to engage you (and/or others) in more detailed discussion of these ideas and issues. I like your algebra example, because I think it helps articulate in simpler terms one of the issues that Joe is getting at. I suspect I’m among Joe’s (and Adam Miller’s) biggest fans, but I think that there are many readers who find his(/their) writing too abstract, abstruse, or philosophically dense to really grapple with. So, I think your example is very helpful, esp. in thinking about the sense in which the specific Mormon covenants we make basically create the stuff (or “topology,” to invoke a term that has both specialist mathematical and non-specialist vernacular connotations) out of which we construct real hope in our lives in the here and now. However, not being a true-blue philosopher, I think that, in order for these rather rarified theological insights to really grow legs that will resonate more widely (at least among less philosophically inclined Mormons), this translation effort that you have begun needs to be applied also to the secular landscape that we find ourselves in. 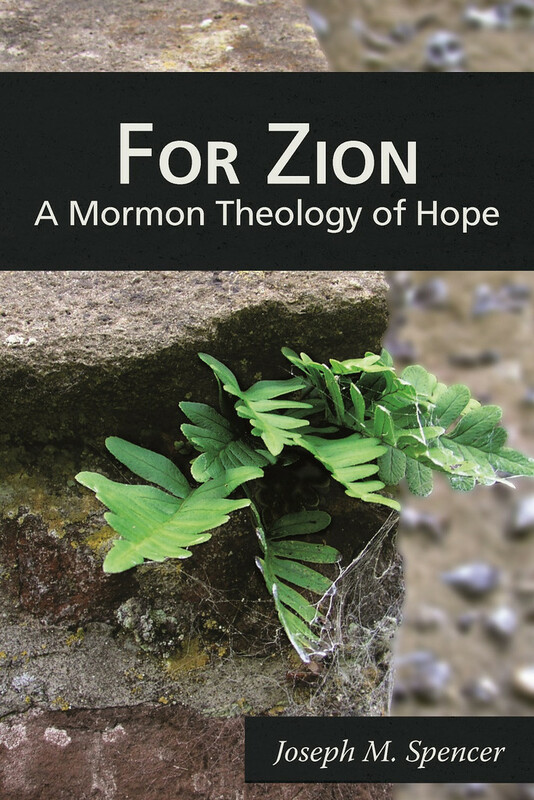 That is, to understand the “space” of hope, I think we need to think quite carefully about the practices, institutions, organizations, beliefs, and communities that comprise our society, and to analyze all of this in light of the standards of Zion (and the concept of hope) articulated by scripture. This is more of a sketch of writing projects that I hope others (including, or esp., myself) will do in the future, than a critique of what Joe is saying, as a philosopher, but I also think it’s worth thinking about in an effort to understand what Joe’s book is and isn’t doing, and how it might take root and sprout root in the future. (Sorry, one more thought that ties my thoughts above to what you said in your post: I think if we consider “the unseen that is included in the seen through its exclusion” from the so-called secular perspective I hinted at above, then one of the most important things we find, IMHO, is a view of human nature that is genuinely capable of loving, forgiving and trusting others in ways that runs counter to most approaches–or, at least, most traditional approaches–to thinking about institutions, organizations, and motivation.